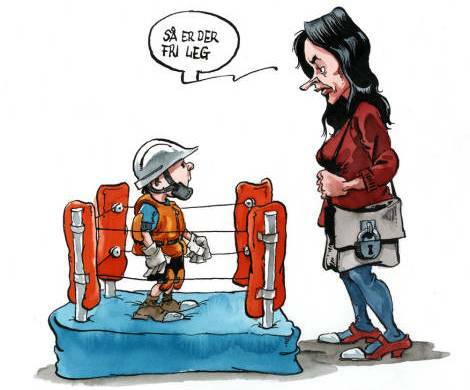 Cartoon by Roald Als in the Danish newspaper Politiken. It reads: "You're free to play..."
I just don't get this Vanity Myth. No matter how hard real bicycle advocates work at getting people onto bicycles there is always a little group of people - let's call them The Fear Minority - who claim that the primary reason for people not to wear bike helmets is... vanity. That's it. Period. People who ride bicycles without a plastic hat are vain. They do so merely because of their hairdo or image. They are egocentric and arrogant and, as this little group of fear merchants will have you believe, they are shitting on the rest of society by acting so selfishly. Seriously... is that all they got? Is that the best they can dream up? The Vanity Myth is the singlemost telling clue that The Fear Minority are quite desperate. They are acutely aware that they don't have any conclusive scientific evidence to show, so they start a personal attack and attempt to wage a guilt-trip campaign against the rest of us. Declaring advocacy bankruptcy in the process. All around the world we're in a race against time to get people onto bicycles. For the public health, for the common good, for rebuilding liveable cities. If wearing a helmet keeps someone on a bicycle, that's great. If not wearing a helmet keeps someone on a bicycle, that's great, too. Unfortunately the latter group is subject to not only bullying on the streets from drafted 'disciples' but also from this Fear Minority themselves who, unfortunately, often have access to funding for campaigns. Not to promote cycling but to perpetuate the car-centric myth that cycling is somehow dangerous and that a plastic hat designed to protect the head against non-life threatening injuries in solo accidents under 20 km/h will magically protect you from certain death. I've noticed that more often than not it is one individual who starts the neo-religious, ideological chanting. Spreading fear on a personal emotional crusade. For example, British Columbia's helmet law was started by one worried mother. The helmet law in Victoria, Australia was the work of one man. All around the world a few individuals are exhibiting enormous power and, in the process, reversing over a century of bicycle culture. Even here in Denmark. A couple of people, here and there, fueled by personal emotions, are working hard at deconstructing the fact that cycling is safe, healthy and good for society. Like everywhere else, they sell their fear cheap to a couple of others and a bonfire is lit, on which the effigy of vanity is burned. A handful of journalists here. A couple of politicians there. You probably know your local versions. It's never a good thing when facts and The Big Picture are overlooked in favour of the frail emotions of a handful of individuals. The Vanity Myth is an excellent, if not frightening, example. I don't doubt that these people sincerely 'believe' they are doing a good thing but it doesn't take long before their belief is cemented and they are no longer capable of rational judgement. Especially if they succeed in recruiting followers. Then they are content to immerse themselves in the group and experience a declining need to explore and learn. Imagine if our ancestors subscribed to this. Imagine a tribe - several families - of hunter-gatherers at their camp. The men are preparing for a hunt and sharpening spears and flint axes. The smaller children are helping, learning this vital skill. Nearby the women are sewing hides together into clothes for the coming winter. Then imagine some schmuck walking around the camp tsk-tsking and shaking his or her head. "You could put your eye out on those sharp sticks..." Or "Sheesh, those needles could go right through your fingers and you could get an infection and DIE!" Fortunately, Homo sapiens didn't listen to this minority. We wouldn't have evolved very far if we had. The primary wish of The Fear Minority is, in my opinion, that everyone else become just like them. That we all happily subscribe to their worrying and adopt stern, disapproving looks and furrowed brows. That we share their unfounded fears. They seek a flock to which they can belong and, unfortunately, fear clubs attract members in our modern society. Intuitive messages, no matter how ridiculous, sell. Frank Furedi's excellent book The Culture of Fear is an instruction manual for understanding how these people think and is an important tome for reversing western societies slide towards fear. Here on Copenhagenize, sociologist Dave Horton discussed Constructing a Fear of Cycling. Not surprisingly, The Fear Minority's personal fears are often way off target. ABC has this article called Do We Worry About The Right Things? Why we fear what we fear. "Less knowledge, more anxiety," says Grafman. "More knowledge, less anxiety." The New York Times had an article last Friday called Keeping Kids Safe From the Wrong Dangers. It's about how parents are incredibly bad at assessing risk. The five things they worry about the most? "Kidnapping, school snipers, terrorists, dangerous strangers and drugs." The five things most likely to cause injury to children up to age 18, according to the Centers for Disease Control and Prevention, are: "car accidents, homicide (usually at the hands of someone they know), child abuse, suicide or drowning." Do the fear minority cast their angst over motoring helmets or traffic calming? Mandatory all-age lifevest laws? Nah. That just may be logical. Perhaps these people could band together and move to some remote camp together, somewhere in the mountains. (Nah... danger of falling rocks...) Or maybe the Amazon. (Nah, sure death by piranha fish...) Okay... some massive building with padded walls, sanitized for all bacteria. Then could live happily every after... and slowly 'safe' themselves into oblivion. The Fear Minority invades your home, too. PUT YOUR MONEY ON THE TABLE... And here's a bet from Copenhagenize. There will never be a city that promotes (or legislates) bicycle helmets that will ever reach double digit modal share for bicycles.